Ken Burns's documentary filmmaking skill needs no explanation. He's done many great projects over many years for public television viewers. He's come through once again with a documentary film that touches the lives of millions of Americans. 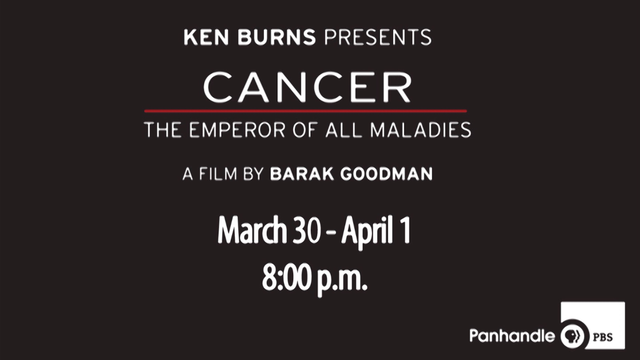 "Cancer: The Emperor of All Maladies" will air March 30 and April 1 at 8 p.m. on Panhandle PBS. You know what? Viewers won't get just a feel for the havoc the disease causes to someone far away from the Texas Panhandle. Viewers will hear the stories of some of our neighbors right here who've struggled to fight the disease, recover from the effect of sometimes-intense medication and then resume their lives once they've whipped the disease. Cathy Pruiett, an Amarillo advertising executive, talks about her struggle with colon cancer and how she sought to lighten the impact of the grueling treatment she was undergoing. On her final day of chemotherapy, Cathy talks about treating that day as a "spa day," complete with cucumber slices over her eyes. She got through the treatment and is cancer free. David Lovejoy's story is similar to Pruiett's. He had blood in his stool, high fever and overall discomfort. He scheduled a colonoscopy and was told as he came out of the "fog of anesthesia" that the nurse had scheduled his surgery to remove the cancer from his colon. "I began thinking about my own mortality," Lovejoy said. "I was 44, 45 years of age and wondered, is this it?" He said he "attacked the diagnosis of cancer" the way he was taught in the military, which was to "identify the objective and focus on the job." He said he's three years past the surgery and has two more years to be declared cancer free. Mary and Larry Barlow tell of their struggles with the disease, as individuals and as a couple. Larry fought off skin cancer; Mary went through the ravages of breast cancer. They, too, have recovered. Ryan Parnell talks about learning he had contracted "classic lyphoma." He said he was feeling discomfort in his stomach and called his doctor, who then scheduled tests. It turned out to be difficulty with his spleen. "You can't go through something like that and not have a change in outlook," Parnell said. He and his wife realized "this is for real." He got through the fight and since then has dedicated himself, along with his wife, to "helping those with cancer." Fear is the common denominator among all the people interviewed by Panhandle PBS. Fear and hope. Indeed, hope -- not to mention a healthy dose of faith -- got them all through their struggles and, yes, their worries. Burns's documentary references cancer as being the "emperor." It's more like a despot, a tyrant. The disease becomes the dominant factor in people's lives. But as the testimonies you hear on the "Live Here" profiles, cancer is not invincible. It can be defeated. The stories are inspiring and they give cancer sufferers hope. Watch more "Story of Cancer" interviews. Why do we 'Live Here'?